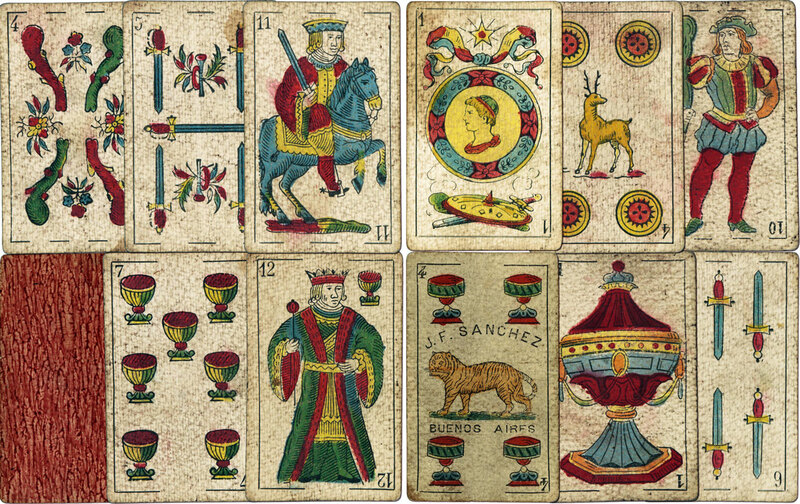 The cards closely follow designs by Sebastian Comas (Barcelona), imported into Argentina since the late 19th century by Fló Hermanos. However, closer inspection reveals that the pack is made up from two different packs. One is a traditional Spanish Catalan type pack (left), the other is a redrawn version of the Catalan pattern (right) based on El Escudo Armado design by Comas. The Spanish Catalan pattern was clearly well-established in Argentina by this time. Comparing the design of the cup symbol in the left and right-hand examples, and the style of the court cards, shows that the cards are from different packs. No further explanation for this is given on the Beineke Library's website. The printing process is given as colour lithography but the cards appear to have been coloured using stencils. The back of the cards has been treated with a roller to create a random pattern.